If you’ve been anywhere other than sunny San Diego for the last few months, chances are you’re ready to hit the beach (and hey, even us locals are itching to get summer started). But what if you made it all the way to San Diego’s shores only to discover that you forgot to pack your swimsuit? Fear not! Whether you need to shop after some forgetful packing or simply want to look like you blend in with the locals, San Diego shops offer some hot summer styles that are sure to make you look like a lifelong beach babe. Sassy vintage suites from Fables by Barrie Amelia can be found at Temptress Fashion in Ocean Beach. Temptress Fashion in Ocean Beach is stocked full of vintage style. Pin-up inspired bathing suits from Fables by Barrie Amelia will have you channeling your inner Marilyn Monroe or Bettie Page. Local designer Elizabeth Southwood’s Sauvage line of swimwear offers luxurious looks based on today’s hottest trends. Visit Sauvage’s La Jolla-based boutique, just blocks away from the beautiful La Jolla Cove. One of San Diego’s most stylish new boutiques, Graffiti Beach in the South Park neighborhood features athletic styles that are as fashionable as they are functional. 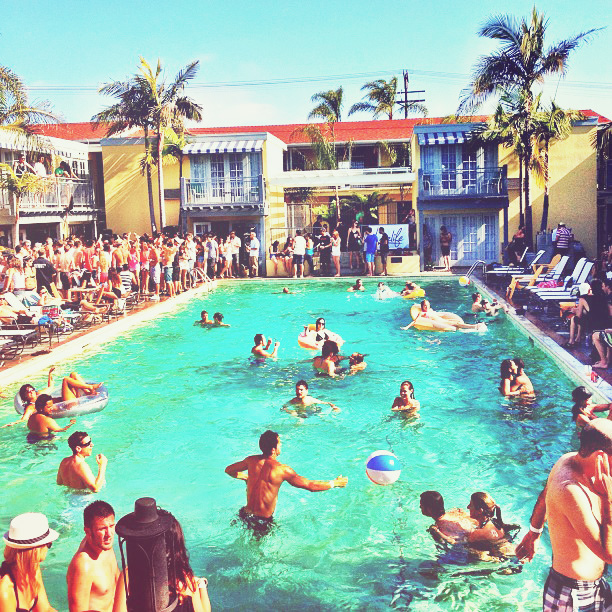 The Lafayette Hotel, Swim Club & Bungalows’ pool parties are always a blast. Intervention Sundays at the Float – Hard Rock Hotel San Diego are all about excess. Prepare for barely-clothed bodies drinking and partying like there’s no tomorrow. Clothing company Fortune 21 will bring a series of pool parties to the Andaz San Diego’s Rooftop Pool this summer, which are sure to be some of the hottest ticket parties in town. Pool Parties at the Lafayette Hotel, Swim Club & Bungalows are the perfect place to show off a retro suit. Built in 1946, the charming vintage neighborhood spot features DJs and lots of fun at their Sunday pool parties each summer. Where will your swimsuit be seen this summer? This entry was posted in Insider Tips, Outdoor Adventures, Shopping and tagged beach, pool parties, Shopping, swim, swimming, swimsuit by Candice. Bookmark the permalink.